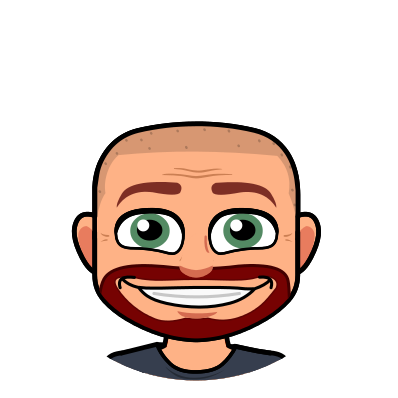 Since I wrote a few weeks back about Positive Parent Contact, Part 1 and Part 2, I have had many questions about Remind 101 and what it can do for teachers. I am going to take this opportunity to focus a little more on this one VERY useful tool. Remind101, first of all, is free! That grabs teacher’s attention right away. We are always looking for inexpensive ways to make our lives easier as well as the lives of the families we are dealing with. It is a site that will allow you to contact your students/parents via text message without having to give out your phone number. A little background about the site. It was created by Brett and David Kopf. While Brett was in college he could see a need for better communication through his own experiences with his classes. He thought that since students are texting all the time anyway, why not talk where they are listening?!? 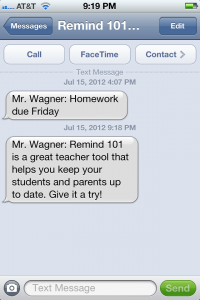 From that, Remind101 was born. That was a few years back. The way texting has grown, it is a great place to reach parents as well as students these days. Here is how Remind 101 works. You can visit their website or download the app for your device and create a free account. Once your account is created you have the ability to create classes within your account. This will allow you to make a “class” to whom you can send messages. You are able to create multiple classes, so you can have one for parents as well as classes for each of your student groups. For each class you create you will receive a code along with a number to text the code to. Give that information to each person you want to invite to that class. When they text the code to the number given they receive a text back asking for their name. Once they reply with their name they are registered to that class. There is nothing for you to do with the information…it is done for you automatically! Once your participants have joined their classes you are ready to start using the tool. 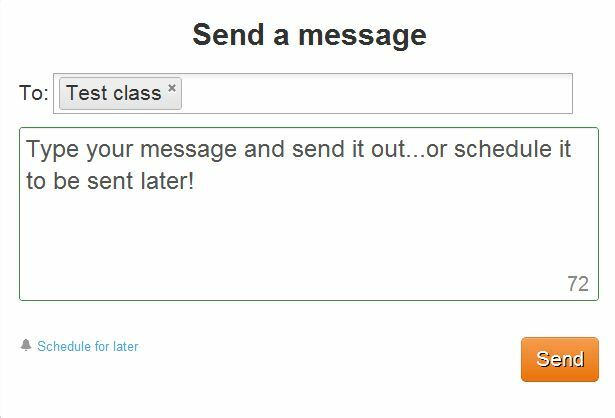 Simply log into the site (or use the app), choose which class/classes you wish to send a message to, type in the message you want to send and send it off. The people who have registered for that class will receive the message as a text on their device. Want to send a message later but afraid you will forget? You can type in messages and schedule them to go out at a later date/time. I don’t think it could get any easier! Another great feature with Remind101 is that it is a one way conversation. You are not allowed to reply to any of the text messages. If you try you will get a “sorry” text back explaining that you can’t reply. Reminders for paperwork to be turned in, upcoming tests, field trips, checking folders, and special occasions at school. Share out exciting events, spelling lists, vocabulary lists, and homework assignments. Keep parents up to date on early releases or changes in schedule. Notify parents of new blog posts or if important information is coming home with their children. That is just a few ideas coming off the top of my head. The possibilities are endless. Sound AWESOME? IT IS!!! Communicate with parents and students without giving out your personal number and keep it as sharing information only. Give Remind101 a try…I don’t think you’ll regret it! Love this idea! Thanks, Paul! It was my pleasure. Thank you for taking a peak at my blog! Great post! Just shared with my teachers. We touched on it briefly at summer tech staff development but your post gives great information! I love the idea of this. I hope my children’s teachers use it! I love the use of technology. One problem though… If you send in your name, is it possible to change your name? I sent the @example to the right phone number. The message said that it didn’t send so I tried it without the @ and now my name is example… Can I fix that? I am not sure I am understanding correctly. Were you trying to join a group already created or were you creating a group? Honestly, the people at Remind101 are fantastic. You may have better luck speaking directly to them. They are on Twitter a lot. If you are a member send them a tweet to get in contact. Otherwise email them at contact@remind101.com with your problem. They will be quick to respond. I did not create the group. I was in the process of joing it. Thank you so much for your help! I will consider your advice. The only problem with having the teacher change your name, is that it only changes it for their class. If you’ve joined any other class, the original name you used will show up. If you will email Remind101 with your phone number or email address (which ever you used to join a class) they will change it for the class you are enrolled in as well as any other future classes. This is Paul Wagner not Ms Stone. I think you must have replied to the wrong post. I know this is free. I have a limited text plan, will this us up those texts? If you are creating texts as a teacher, none of the text messages you send will go against your plan. Those receiving text messages from Remind101 will have it count against their text plan. How about the ones I receive in the beginning when setting up? If you are the teacher you never have to receive texts. You don’t even use your own phone number. Go to remind101.com and set up an acct. it gives you a number that will be used for your acct. your phone number is never asked for. 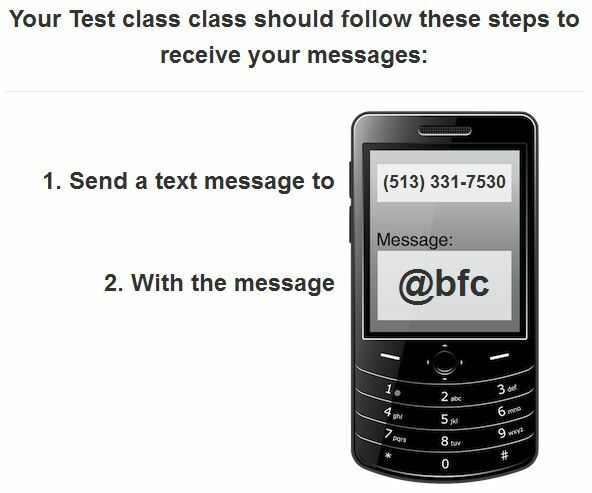 The only way you will receive a text message on your own personal number is if you choose to join one of your classes and receive the notifications. Thanks for this information. I too have a limited plan and was hesitant to use if each text I sent counted as 24-25 text. I will definitely start to use remind101. I read somewhere that you can send pictures with this app…do you know how I can do that? I have not heard that it is possible to attach images. I did a quick search of the site and could not find anything on this either. As far as I know it is text only. my daughter had one with a recent phone number and then gave the number to my second daughter and it says my first daughters name, how do I change the name for my second daughter to use in class?? I assume you are saying your 2nd daughter now has your 1st daughter’s phone number? Remind101 will remember your number and associate it with any account you create. I have never heard of this happening before. I would contact Remind101 through their site and see if they can reset something on their end. Is there a way to set multiple remind dates for an activity? Not to my knowledge. You can revisit what you have sent and more than likely resend. Otherwise you could copy/paste your message in a new message and essentially schedule it twice. What is the maximum number of people who can join a class? I believe you can have over 200. If you need more contact Remind101 and they will work with you.